Background: The immune system depends on white blood cells (WBCs) to fight infections in the human body. Smoking tobacco causes the increasing of WBCs comparing with nonsmokers due to virus infection and bronchitis. 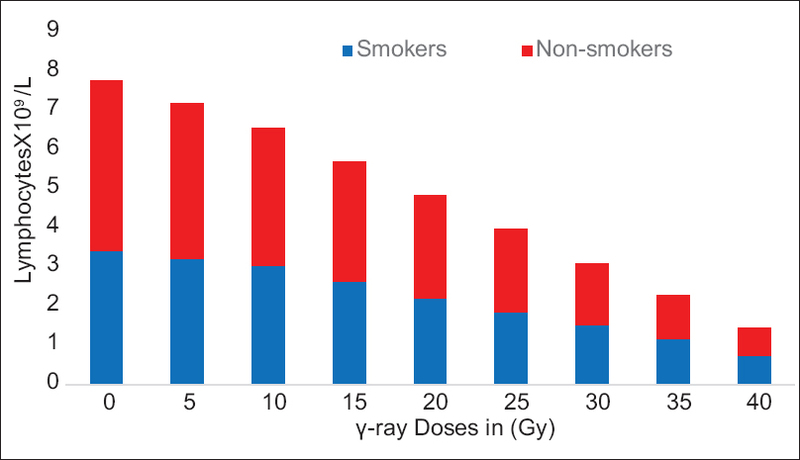 Exposing blood samples of smokers and non-smokers donors to gamma-ray (γ-ray) will affect the structure of the WBCs then as a result will cause the declination in the values of total leukocytes, lymphocytes, and neutrophils in the smokers' blood is greater than of nonsmokers and this confirms that these cells are more fragile, weak, and less tolerant to external stimuli. Objectives: The objective of this study is to compare the effects of increasing doses of γ-ray on total leukocyte, neutrophil, and lymphocyte count between smokers and non-smokers. Materials and Methods: Ethylenediaminetetraacetic acid blood samples were collected from healthy donors: Ten smokers and ten nonsmokers. 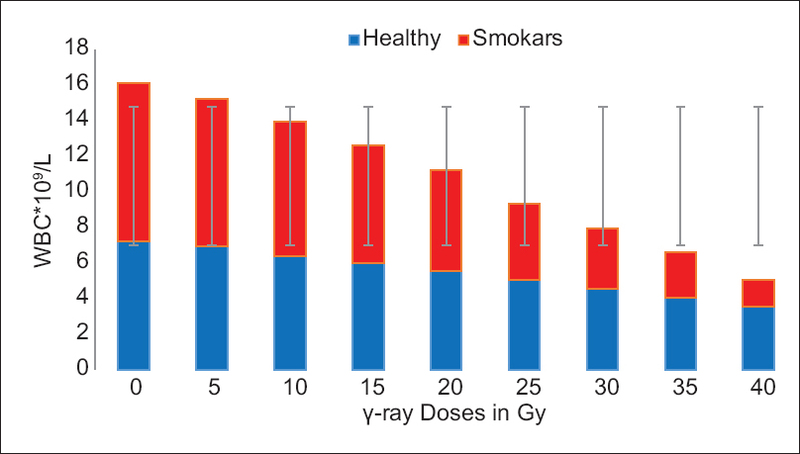 Samples of both groups were exposed to incremental doses of γ-ray (5–40 Gy). Total and differential leukocyte count for each sample was performed by autoanalyzer. 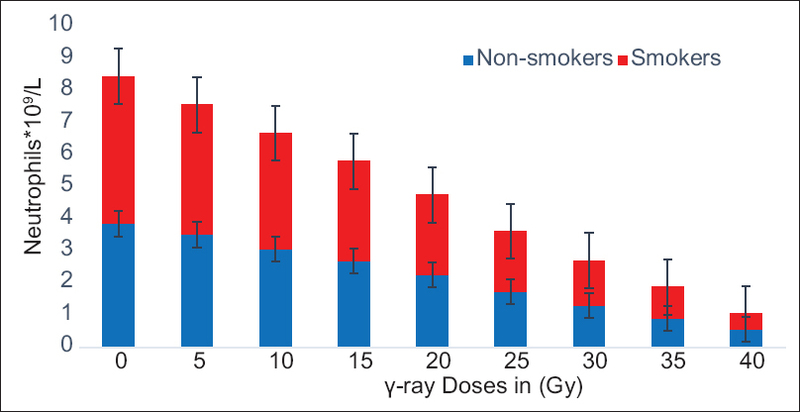 Results: Smokers had higher average total leukocyte, lymphocyte, and neutrophil counts than nonsmokers before exposure to radiation. However, they showed more decline than nonsmokers after exposure to increasing doses of γ-ray. Conclusions: By increases the doses of γ-ray, the declining in the values of WBCs, lymphocytes, and neutrophils in the smokers blood is greater than of nonsmokers and this confirms that these cells are more fragile, weak, and less tolerant to external stimuli. White blood cells (WBCs), also called leukocytes, are an important part of the immune system. These cells help fight infections by attacking bacteria, viruses, and germs that invade the body. WBCs originate in the bone marrow but circulate throughout the bloodstream. There are five major types of WBCs: Neutrophils, lymphocyte, eosinophils, monocytes and basophils. Total and differential WBC count is a part of complete blood count. Blood contains a percentage of each type of WBC. Sometimes, however, WBC count can increase or decrease out of the healthy range. Denoted by the lower-case Greek letter gamma-ray (γ-ray[\displaystyle\gamma]) is penetrating electromagnetic radiation of a kind arising from the radioactive decay of atomic nuclei and therefore consists of high-energy photons. γ-rays are ionizing radiation and are thus biologically hazardous. Typically have frequencies above 10 exahertz (or >1019 Hz), and therefore have energies above 100 KeV and wavelengths <10 pm (/1011m), which is less than the diameter of an atom. The measure of the ionizing effect of γ-rays is called the exposure and the gray (Gy), which has units of joules per kilogram, is the International System of Units of absorbed dose, and is the amount of radiation required to deposit 1 J of energy in 1 kg of any kind of matter. γ-rays cause damage at a cellular level and are penetrating, causing diffuse damage throughout the body. Low levels of γ-rays cause a stochastic health risk, which for radiation dose assessment is defined as the probability of cancer induction and genetic damage. High doses produce deterministic effects, which is the severity of acute tissue damage that is certain to happen. This is a case–control study. It was conducted at Al-Amal Hospital for Cancer in Baghdad, Iraq from September 1 to October 31, 2016. This study was approved by the Ethical Committees of both Department of Pathology at Al-Mustansiriya University, College of Medicine, and Department of Physics at Faculty of Science, University of Baghdad, Baghdad, Iraq. This is in conformation to the Declaration of Helsinki. Verbal informed consent was obtained from all participants. The method of measuring WBCs, lymphocytes and neutrophils number, are using analyzer, as follow: blood samples were shaken for 15 min, in analyzer shaker, then by press on start an automatically metallic needle will step down inside the tube and draw out about 2 μml from a blood sample, after a few seconds, all blood data will appear on analyzer screen. The hematology analyzer used in this project is a model: Diagon D-cell 5D, Serial No. 171021655D, made in Hungary: 2011. In this research, it was observed that number of WBC values in almost of smokers were higher from its values in nonsmokers donors, and γ-ray observed to be more effective on smokers blood than nonsmokers as shown in [Table 1] and plotted in in [Figure 1]. The results clarify that the average values of WBCs in control of smokers blood samples are higher than in control samples for nonsmokers, and when the whole blood samples exposed to doses of γ-rays, it was observed that WBCs in smokers samples decreased more than nonsmoking blood samples as shown in [Figure 2]. 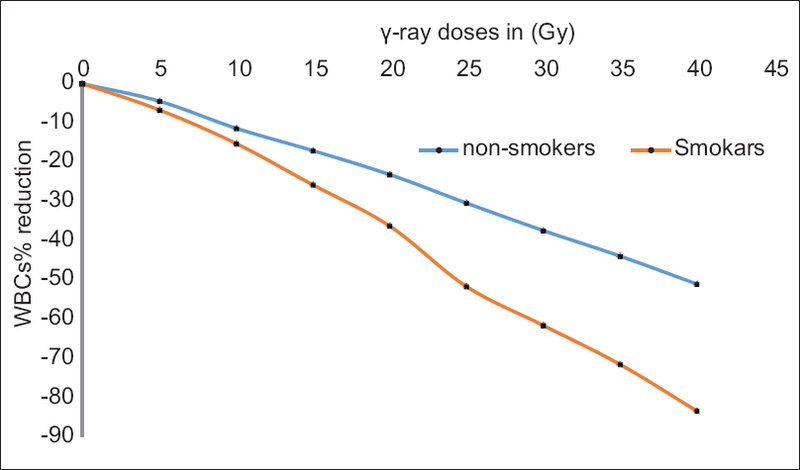 Comparison the effect of γ-ray on the lymphocytes in the blood between smokers and non-smokers donors was shown in [Table 2] and plotted in [Figure 3]. 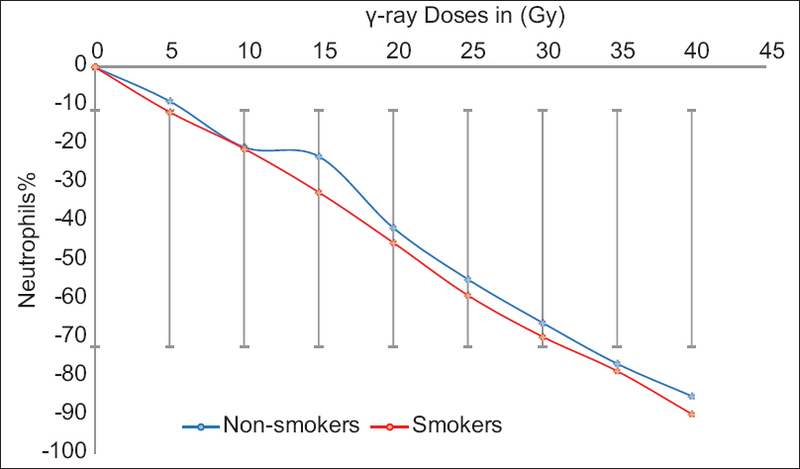 The reduction values of lymphocytes from the control (0) Gy with effect of γ-ray in smokers and non-smokers blood of donors were plotted in [Figure 4]. 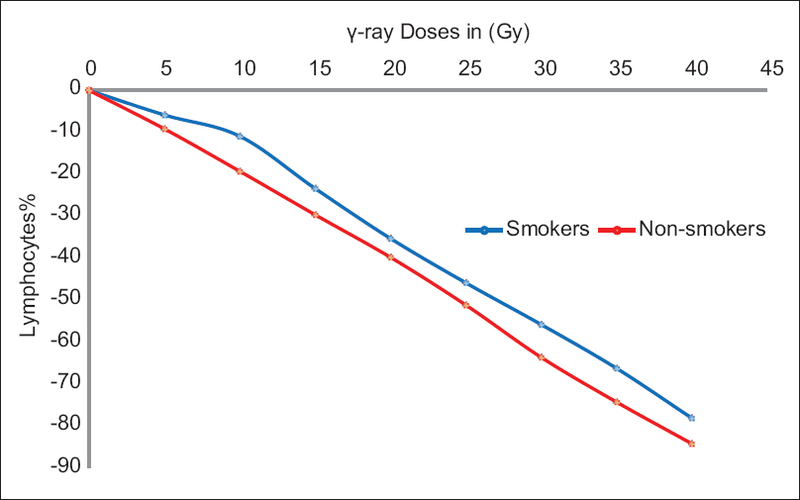 Comparison the effect of γ-ray on the neutrophil in the blood between smokers and non-smokers donors was shown in [Table 3] and plotted in [Figure 5]. [Figure 6] shows the effect of different doses of γ-ray on neutrophil count. In this study, the average values of WBCs, lymphocytes, and neutrophils in control of smokers blood samples are higher than for nonsmokers, and when the whole blood samples exposed to the doses of γ-ray, then it observed that all values of WBCs, lymphocytes, and neutrophils of blood samples for smokers will decreasing rapidly more than of nonsmokers. Smoking tobacco promotes leukocyte transit from bone marrow to the small pulmonary vessels and this effecting on alveolar walls favors the development of pulmonary emphysema. High lymphocyte caused by inflammatory bronchial pneumonia resulting from smoking tobacco. Radioactive forcing on the cells of WBCs, lymphocytes, and neutrophils will arising because of the direct effect of γ-ray on deoxyribonucleic acid (DNA) that kills the cells, where direct effect of ionizing radiation happens when photons or secondary electron energy ionizing (directly affect) the biologic macromolecule such as a protein, lipid, carbohydrate, or nucleic acid. DNA is the important molecule, in the nucleus of the cell, and it controls the genetic information, function of the cell, and its replication. When radiation interacts with DNA molecule, the chromosomes are not replicated properly and the cell will be destroyed by direct interference with its life-sustaining system, thus the radiation caused single-stand break and double-stand break in DNA., Ionizing radiation-generated reactive oxygen species resulting in oxidative damage to the cell membrane and its consequent role in the mechanism of apoptotic cell death have been receiving growing attention in cellular radiobiology. Through the presented results, it has been noted that the effect of γ-ray on the cigarettes smokers and non-smokers bloods, seems to be similar with low doses of 5 Gy. But by increases doses of 15 Gy, the declining in the values of WBCs, lymphocytes, and neutrophils in the smoker's blood is greater than of nonsmokers, and this confirms that these cells are more fragile, weak, and less tolerant to external stimuli. The high-average values of WBCs, lymphocytes, and neutrophils in control blood samples of cigarettes smokers (average smoking duration 8 years) more than the nonsmokers. This may be attributed to chronic bronchitis because of smoking. The decreasing in WBCs, lymphocytes, and neutrophils values with 5 Gy of γ-ray seems to have a similar effect in smokers and non-smokers blood samples. The decline in WBCs, lymphocytes, and neutrophils values as a result of the effect of γ-ray doses (more than 5 Gy) in blood samples for smokers than that of nonsmokers is attributed to weak cellular structure in each of the cell wall DNA for WBCs cells. Yeung MC, Buncio AD. Leukocyte count, smoking, and lung function. Am J Med 1984;76:31-7. Friedman GD, Siegelaub AB, Seltzer CC, Feldman R, Collen MF. Smoking habits and the leukocyte count. Arch Environ Health 1974;29:26-137. Friedman GD, Klatsky AL, Siegelaub AB. The leukocyte count as a predictor of myocardial infarction. N Engl J Med 1974;290:1275-8. Phillips AN, Neaton JD, Cook DG, Grimm RH, Shaper AG. Leukocyte count and risk of major coronary heart disease events. Am J Epidemiol 1992;136:59-70. Grimm RH Jr., Neaton JD, Ludwig W, for the Multiple Risk Factor Intervention Trial Research Group. Prognostic importance of the white blood cell count for coronary, cancer, and all-cause mortality. JAMA 1985;254:1932-7. Schwartz J, Weiss ST. Peripheral blood leukocyte count and respiratory symptoms. Ann Epidemiol 1993;3:57-63. Malech HL, Gallin JI. Current concepts: Immunology. Neutrophils in human diseases. N Engl J Med 1987;317:687-94. Aharonian F, Akhperjanian A, Barrio J, Bernlohr K, Borst H, Bojahr H, et al. The TeV energy spectrum of markarian 501 measured with the stereoscopic telescope system of HEGRA during 1998 and 1999. Astrophys J 2001;546:898-902. Valentin J. The 2007 Recommendations of the International Commission on Radiological Protection. ICRP Publication 103. Available from: http://www.icrp.org/docs/ICRP.publication. 103-annals.of.the.ICRP. 37 (2-4)-free.extract.pdf. [Last accessed on 2017 Mar 15]. Zalokar JB, Richard JL, Claude JR. Leukocyte count, smoking, and myocardial infarction. N Engl J Med 1981;304:465-8. Gillum RF. Peripheral leukocyte count and pulmonary function in a national sample of women and men. Ann Epidemiol 1991;1:525-31. Kitchens J. United State Environment Protection Agency. Ionizing and Non-Ionizing Radiation; 2012. Available from: https://www.epa.gov/radiation. [Last accessed on 2017 Feb 10]. Turner JE. Atoms, Radiation, and Radiation Protection. Third, Completely Revised and Enlarged Edition. Weinheim: WILEY-VCH Verlag GmbH & Co KGaA; 2007. Available from: http://www.nuclear.dababneh.com/Radiation-Undergrad-2/Atoms,%20Radiation,%20and%20Radiation%20Protection.pdf. [. [Last accessed on 2017 Mar 05]. Langland OE, Langlais RP. Principles of Dental Imaging. 2nd ed. Philadelphia: Lippincott Williams and Wilkins; 2002. p. 75. United State Environment Protection Agency,” Ionizing and Non-Ionizing Radiation”; 2012. Wrixon AD. New ICRP recommendations. J Radiol Prot 2008;28:161-8. [Epub 2008 May 22]. Clarke R, Valentin J. ICRP publication 109. Application of the Commission's Recommendations for the protection of people in emergency exposure situations. Ann ICRP 2009;39:1-110.